CARBON FOOTPRINT: The total amount of emissions of greenhouse gases that is caused both directly and indirectly by an individual, organization, event or product. ENVIRONMENTAL DESIGN: An approach to the design of products, systems and spaces that makes good use of natural resources to create the everyday environment in which we live. GREENHOUSE GAS: Gases in the atmosphere such as carbon dioxide (CO2) and ozone that absorb and give off radiation that contributes to global climate change. LANDSCAPE ARCHITECTURE: The profession of designing outdoor environments such as parks, building sites or urban streetscapes. SUSTAINABLE: Using materials and methods that won’t deplete natural resources. Something sustainable is capable of being continued without harming the environment for future generations. 1. I’m careful about the amount of paper I use. I try to recycle as much used paper as I can. 2. I turn my computer off after I use it. I unplug video games and chargers when not in use. 3. I’ve replaced the incandescent lightbulbs in my room with compact flourescent ones. 4. I have a vegetable garden. 5. I have a container to recycle bottles and cans. 6. When I need to go somewhere a short distance away, I ride my bike. 7. I take short showers. 8. I have planted a tree. 9. I like to design things using recycled materials. 10. I share what I know about the environment with my family and friends. Get your score and learn how to help! Color can either stand out from or blend in with the environment. The ability of something that is otherwise visible to “hide in plain sight” is called camouflage. Camouflage can occur naturally in many animals. If an animal cannot be seen by its prey, this increases its chances of survival and reproduction. Examples of this include a polar bear in snow, a frog on a leaf or a deer in the woods. Another animal whose appearance changes its color to match any environment is the chameleon. 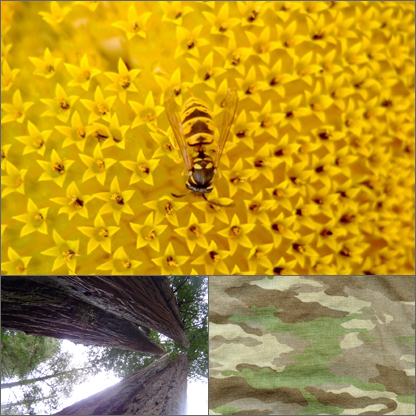 Sometimes an object’s ability to match its surroundings is an important consideration for design, such as in the design of military combat uniforms. Sometimes it is important for an object to stand out from its surroundings, as in the case of a stop sign. What other examples can you think of where it might be important for the color of something you design to match or to contrast with its environment?